AMBW Romance – Special Price! East meets West in this passionate romance novella by Carly Chase! LA gym owner Candace Jackson is feeling jaded after too many bad dates, and is determined not to get her hopes up about the next man to ask her out. However, when the handsome, wealthy and mysterious Akito walks through the door to ask about starting up a new martial arts course at her gym, she feels an attraction she just can’t fight. Akito is not all that he seems, however, and has a past in Tokyo that he is terrified might catch up with him. No matter how much he wants Candace, he can’t allow her to be put in harm’s way because of the secrets he is running from. 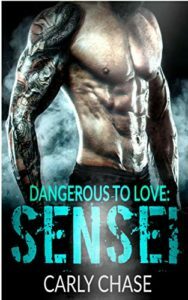 He may have the fighting skills and the strength to protect her, but can she ever be truly safe while he’s around? Can Akito face up to his demons, and will Candace be able to accept him when she knows the truth about him?